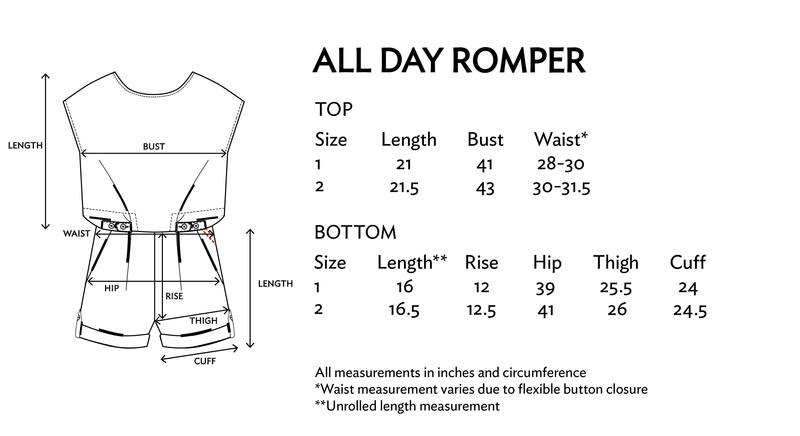 Meet the All Day Romper. Inspired by loyal #mattertribe member Rachel, we took the best parts of the All Day Jumpsuit and made an edit to this romper. An elegantly curved neckline balances a longer drape on the back, with pleats and tapered cuffs for a tailored, smart finish. Worn high or low depending on which buttons are used or what mood you’re in, this style is an effortless combination of modern functionality and comfort. PS - If you need some tips, here are 3 ways to wear the All Day Romper. Model is a US Size 4-6, wears Matter Size 1. 173cm tall. Four-button closure keeps it adjustable, along with a two-button option along the tapered cuffs. Finished with pleated details for a subtle silhouette. Bottom cuffs can be folded two ways - buttoned up or rolled down. I loved the style but was unsatisfied with olive color. It looked deeper and greener in pictures, but weird and pale when I received the real thing. I will not wear this much. This has become my favourite Matter piece in my wardrobe! Easy and comfortable to wear.